This is beautiful and so delicious served on my Christmas Dessert table .Makes a big impression .Its a little more work but worth it. Line a 9x5x3 inch baking pan with a strip of wax paper measuring 22x3 inches. Place lengthwise, allowing excess wax paper to hang over sides. Beat egg yolks and sugar until thick. Set aside. Melt chocolate with 2 tablespoons cream in a heavy saucepan over low heat. Stir until smooth. Quickly whisk in egg yolk mixture and butter. Remove from heat; stir in vanilla and chill until thick but not solid. Whip remaining cream to peaks. Fold 1/3 of the whipped cream into chocolate mixture. Gently fold in remaining whipped cream. Do not over-mix. Spread over bottom of prepared baking pan. Cool in freezer while preparing eggnog mousse layer. Eggnog Mousse: In a small bowl, sprinkle gelatin over 3 tablespoons cream. Set bowl in a pan of hot, simmering water, stir to dissolve. In a double boiler, melt white chocolate; stirring until smooth. Using a wire whisk, add gelatin mixture, egg yolks, eggnog and nutmeg to melted chocolate. Cool until very thick, about 20 minutes; stirring occasionally. Whip remaining cream to peaks. Fold 1/3 whipped cream into eggnog mixture. Gently fold in remaining whipped cream. Do not over-mix. Spread over chocolate mousse layer. Cool in freezer while preparing raspberry mousse layer. Raspberry Mousse Layer: In a saucepan, heat but do not boil raspberries. Cool and force through sieve with back of spoon to remove seeds. Set raspberry puree' aside. In a small bowl, sprinkle gelatin over 3 tablespoons cream. Set bowl in a pan of hot, simmering water, stir to dissolve. In a double boiler, melt white chocolate; stirring until smooth. Using a wire whisk, add gelatin, egg yolks, and raspberry puree to melted chocolate. Cool until very thick, about 20 minutes; stirring occasionally. Whip remaining cream to peaks. Fold 1/3 whipped cream into raspberry mixture. Gently fold in remaining whipped cream. Do not over-mix. Spread over eggnog mousse layer. Cover with plastic wrap and refrigerate at least 8 to 12 hours. To remove mousse from pan, run a warm knife around the sides of the pan. Dip bottom of baking pan very quickly in large pan of hot water. Place an oblong platter over the baking pan and invert. Carefully begin lifting pan, holding wax paper strip at the same time. Chocolate mousse layer will now be on top. Slowly remove wax paper from mousse. Refrigerate immediately while preparing chocolate shell. Chocolate Shell: In a saucepan, heat all ingredients on low. Stir until smooth . Remove from heat, allow to cool and thicken to a spreading consistency. Pour over mousse layers and spread with metal spatula allowing chocolate to flow down sides of mousse layers. 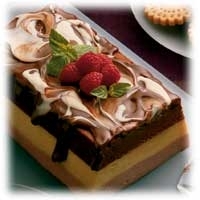 If desired, melt 3 ounces of white chocolate, chopped and swirl into semi-sweet chocolate on top of mousse layers. Refrigerate. Cover with plastic wrap after chocolate hardens. Yuletide Layered Mousse may be prepared 2 days in advance. Eggnog Sauce: In a saucepan, heat eggnog and nutmeg to simmering point. Beat egg yolks and sugar until thick. Add 1 cup hot eggnog to egg yolk mixture, beating constantly. Return to saucepan, cook and stir until slightly thickened. Remove from heat and stir in vanilla. Allow to cool. Refrigerate, covered up to 2 days. To serve: Just before serving, remove mousse from refrigerator. Slice 1/2 inch thick with a warm knife in a straight, downward motion. Place slice flat on a dessert plate. Spoon about 1/4 cup eggnog sauce around edges of each mousse slice. Like chef2's recipes? Never miss an upload!